Over the next few months many of the Big 4 firms will be conducting partnership panel interviews for their candidates on partnership track and also partner panel interviews for their senior managers wanting to become directors. Therefore, in this blog post I will share 6 tips for how to prepare for your partnership panel interview or just your partner panel interview. Whether or not you are going for director or partner, the same advice holds true for a partner panel interview. Your partner panel interview is not something you can rock up to and hope to succeed with no preparation. Of course, you know that. This means allocating time for the month before the partner panel interview to make sure that on the day you are at your best and word perfect. Unfortunately client work can often scupper your plans for preparation. Only you can make sure that your preparation time for the partner panel is sacrosanct. Your partners are looking for people who are acting as if they are one of them. This means having a discussion with them about your business case, not presenting to them your business case. The best way to do this is to take control at the beginning of the partner panel interview and say what you would like to happen. E.g. I’d like to go through my business case for 5 or so minutes and then open it up to a discussion. I’ve lost count of the amount of times people have told me that they got feedback that they presented rather than had a discussion with the partners in their partner panel interview. There isn’t such a thing as a perfect business case. If you think you have one, then you will probably not pass your partner panel interview because you are not self aware or commercial enough. There are always weaknesses to your business case. Or there are question marks about your ability to achieve the promise of your business case. Therefore, identify what these weaknesses will be. If you can’t do this, then ask your partner, mentor or sponsor. They will find them for you. Once you have identified your weaknesses then anticipate the questions you will be asked about them. These questions will come, so you need to be ready for them. How can you mitigate the risks? What personal strengths do you have which will compensate for the weaknesses you all have? Nearly all partner panel interviews will require you to present your business case and then have a question and answer discussion with the partners. You need to be word perfect for the presentation. This means practicing it over and over again, until it is stuck in your head. After all nerves can do funny things to you! Your key messages have to be locked in, so that they just come out the way you want them too. You only have (normally) a maximum of 20 mins to present your business case to the partners on your panel. We’ve had clients who’ve only been given 10 mins to present their business case. When you present your business case you want to create a lively discussion between you and the panel members. Presenting a large slide deck to your panel is just not going to cut it. They will be snoozing in their seats before you know it… and with it any hope you had of making partner. To avoid the risk of boring your partners when you present you normally need a one page handout which we call a talksheet. 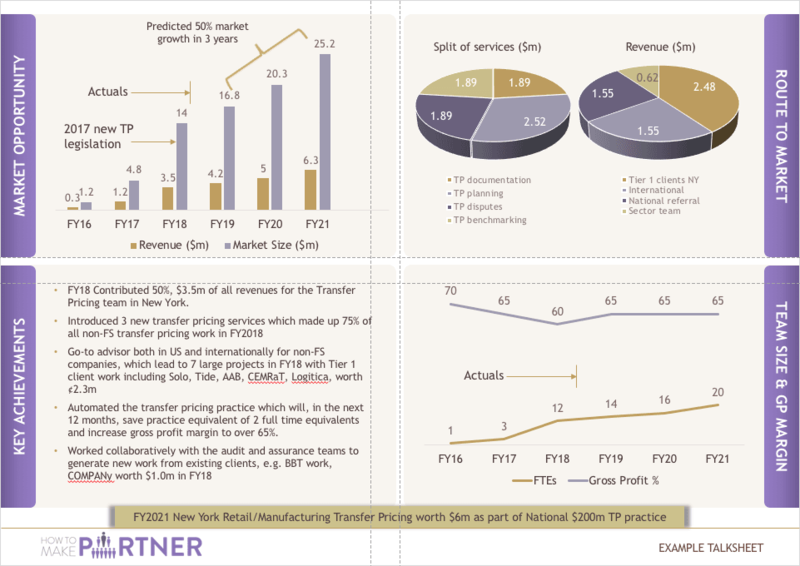 See example on the left of a talksheet based upon a successful client we worked with who made it to partner in his Big 4 firm at the first time of asking. Of course, it would make your life much easier if you could use our Talk Sheet template as the starting point for your own Talk Sheet. That’s why we put it into a Powerpoint presentation which you can easily change the data and colour scheme to make your own. Click here to download the FREE template we used to make this Talk Sheet to build your own Talk Sheet in under 60 minutes. To find out more about using a talk sheet read our article on creating your own talksheet by clicking here. 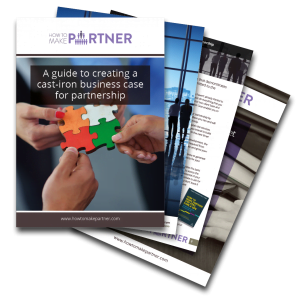 NEED HELP TO CREATE YOUR BUSINESS CASE FOR PARTNERSHIP?